This is easy to use, easy to apply and quick drying (less than a minute for a coat). 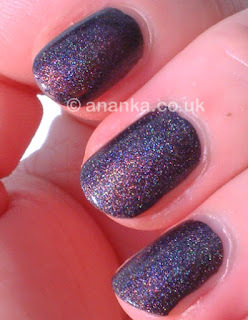 It's a gorgeous purple holo and looks fantastic in the sunshine! It's really nice and I really like it! This is the first time I've tried a holo without the Aqua Base and I think this holo is okay without it! Lasted well. It's really gorgeous. I think I will have to buy it ;o). Oooh that's lovely! I still haven't tried any A-England polishes, that one looks gorgeous. We are having a few sunny days here and I think it might be like that for a week - hopefully! Oh this is one of my favorite A Englands and it looks beautiful on you!!! !